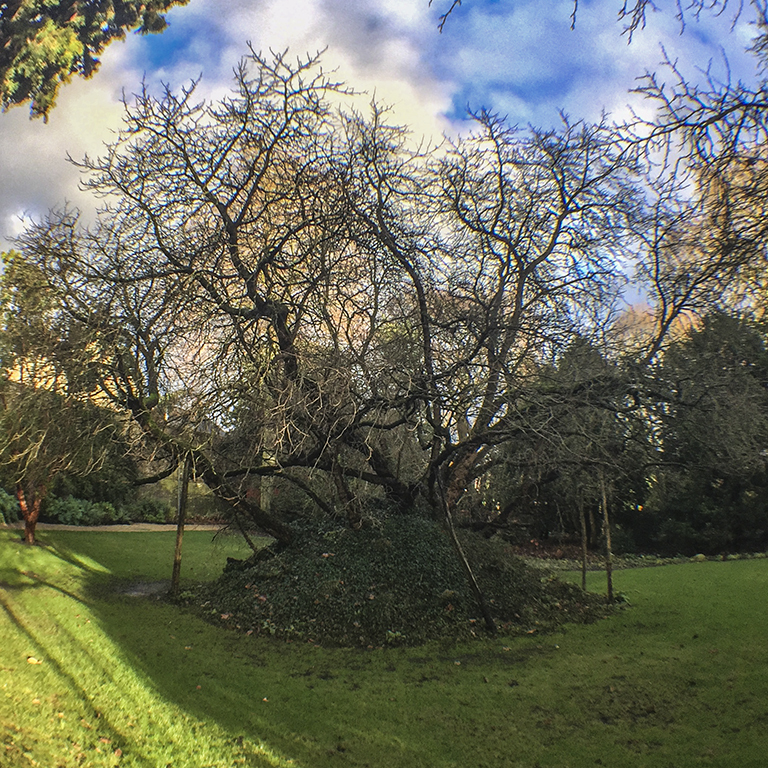 One of the best-known veteran mulberry trees in England is the so-called ‘Milton Mulberry’ in the Fellows’ Garden at Christ’s College, University of Cambridge, which Peter Coles wrote about in December 2018 (read the article here). The tree was planted in 1609, most likely alongside several others, when Christ’s (like nearby Emmanuel, Jesus and Corpus Christi colleges) decided to support James I’s project to start an English silk industry, with mulberry groves to feed the silkworms. 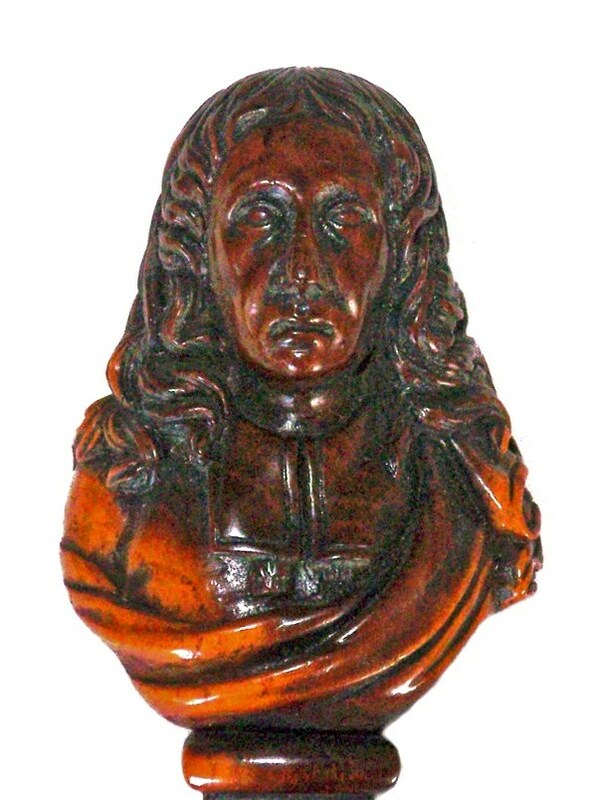 Sculptural likeness of John Milton made from mulberry wood. Pinto collection (Birmingham City Museum and Art Gallery). The veteran tree at Christ’s has come to be associated with one of the College’s most illustrious students, the poet and man of letters, John Milton (1608 – 1674). Milton was a student at Christ’s from 1625 and graduated in 1629, receiving his Masters’ degree a few years later, in 1632. The tree would have been at least 20 years old when the young poet knew it and already a decent size, but hardly impressive enough to inspire poetry. Most of the major works for which Milton is known (such as Paradise Lost) were published much later. The King’s sericulture project soon ran out of steam, though, leaving behind a number of veteran mulberries up and down the country, which have survived from the 17th century and mostly used to produce copious quantities of jam. 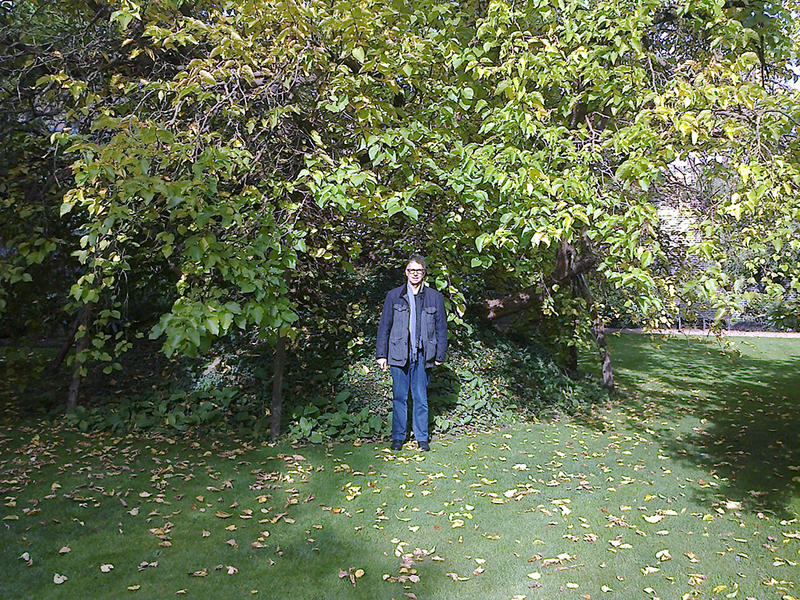 The Christ’s College ‘Milton Mulberry’ is not the only mulberry tree to be associated with the poet though. In the early 17th century Milton was a regular guest of his former schoolboy tutor, the Scottish Presbyterian, Reverend Thomas Young, who had been appointed vicar of Stowmarket (Suffolk) in 1628. Young was one of the founders of a group of five controversial Puritan clergymen, going by the name of Smectymnuus (an acronym based on their names), which Milton later defended in his own pamphlets. 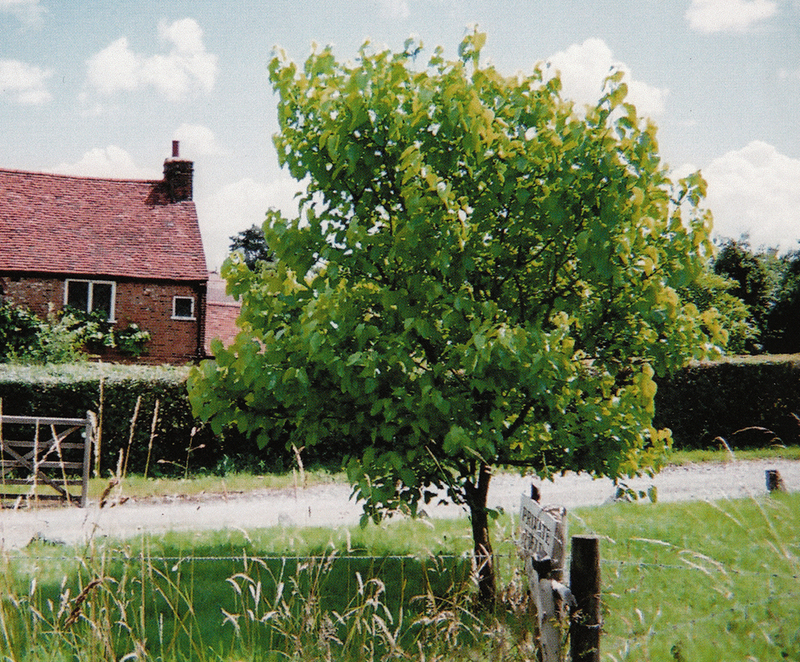 The garden of the Old Vicarage (since renamed Milton House) boasts a splendid black mulberry tree, which could date back to this time, or be a descendant of an older tree. 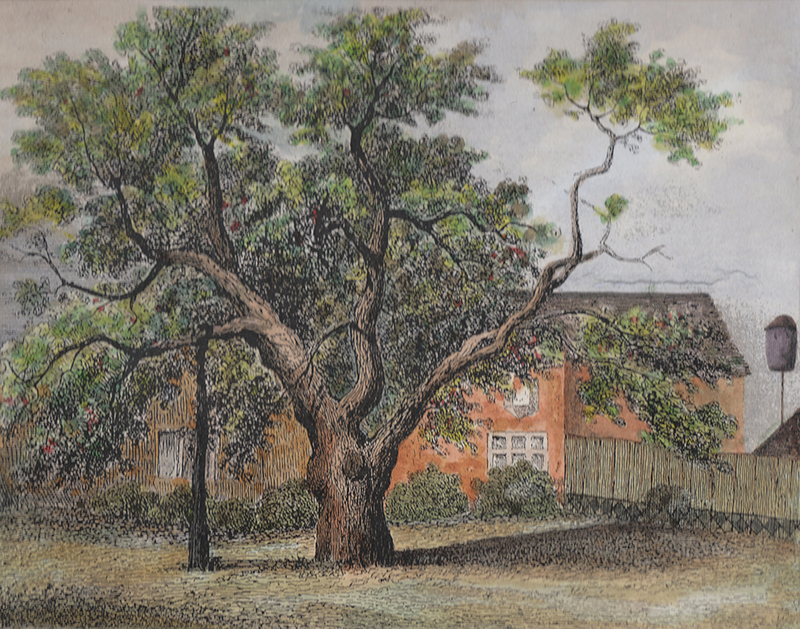 The black mulberry at Milton House in Stowmarket may have been planted in Milton’s time. In Victorian times, when Reverend A.G.H. Hollingsworth was vicar of Stowmarket, he apparently made as much as ten gallons of wine using fruit from the tree. 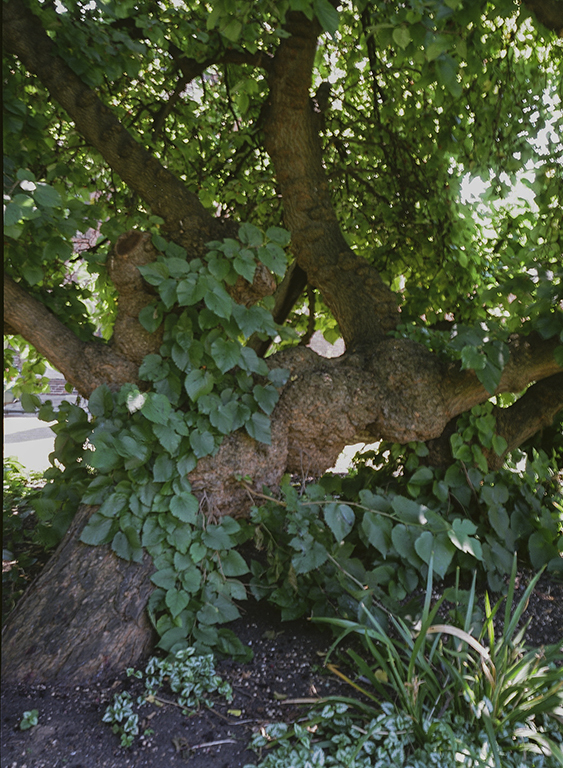 The tree was blown over in 1939, but mulberries are tremendous survivors and are able to re-grow from flattened trunks and branches that touch the ground – a process known as ‘layering’. 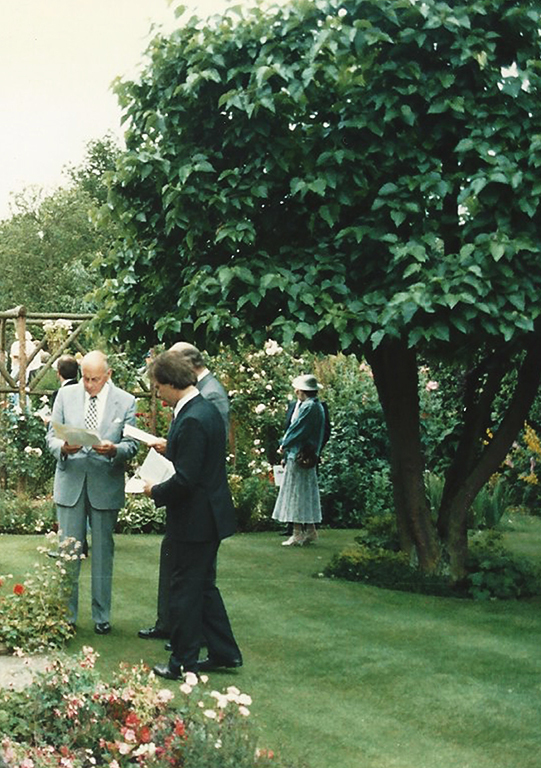 We will never know if Milton had a hand in planting the tree, but its association with the poet is ingrained in local history. Milton House is now home to Stowmarket Council, with the mulberry featuring on its website. 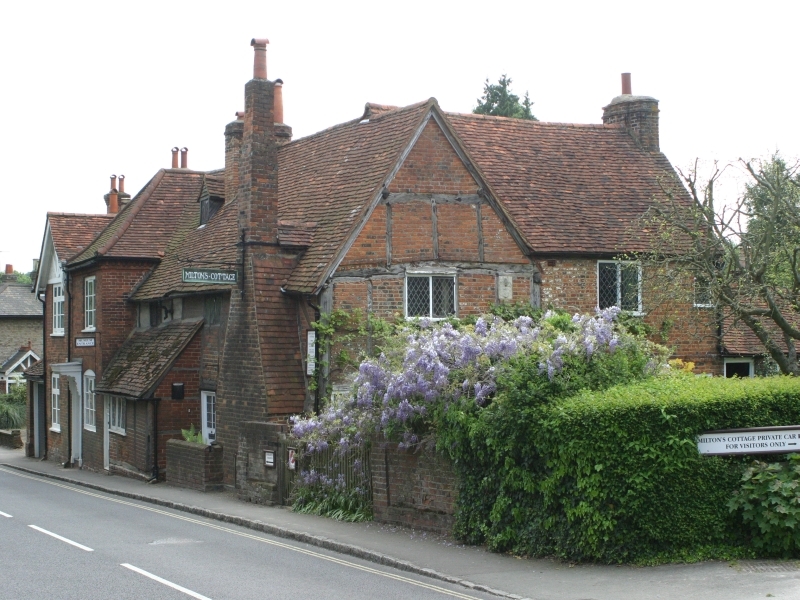 In 1665, to escape the bubonic plague that was ravaging London, Milton moved with his wife and daughter to a modest cottage found for him by his former student, Thomas Ellwood, in Chalfont St Giles (Buckinghamshire). It is here that he wrote his major works, Paradise Lostand Paradise Regained.Built in the late 16th century, and now known as Milton’s Cottage, it has a Grade II listed historic garden and, until recently, featured an 80 year-old mulberry tree, grown from a cutting from the Christ’s College tree. An 8- year-old scion of the Milton Mulberry in Cambridge had to be felled recently. This tree had to be felled a few years ago, but a cutting was taken from it and planted out near to the car park, where it is now flourishing. The cottage is now a museum, displaying various artefacts associated with Milton, including early editions of Paradise Lost. Another celebrated offspring of the Christ’s Milton Mulberry is the ‘Queen’s Mulberry’ in Preacher’s Court at Charterhouse in London (see our previous article here). 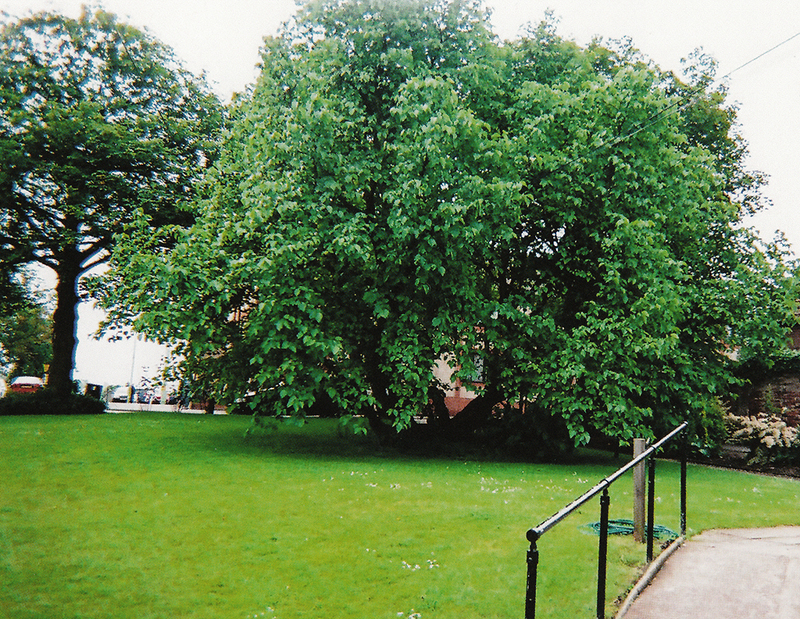 The tree is thought to have been planted around 1840. There are six other mulberries at Charterhouse, but their provenance is not certain. As part of celebrations of the 400th anniversary of John Milton’s birth, a cutting from the mulberry tree at Christ’s College, Cambridge was planted at the Woodland Trust’s Drovers Wood, in Upper Dreinton, Hereford as part of the Hay Literary Festival. No doubt more cuttings will be taken from the Christ’s college tree, further multiplying ‘Milton’ mulberries – a scion for a scion. If readers know of other ‘Milton Mulberries’ please let us know. This entry was posted in Uncategorized and tagged Cambridge, Chalfont St Giles, History, London, Milton, Mulberry, poet, Stowmarket. Bookmark the permalink.